The mild temperatures in Florida—not too hot, not too cold—typically make April a very popular month for visitors. Historically, that trend shows in theme park attendance. The first three weeks of the month at Disney World are typically very crowded, and attendance is moderate during the last week of the month. The same holds for most other theme parks and major attractions. Mild temperatures during the daytime and at night make April a great month to visit Florida. This sub-tropical state has excellent weather year-round, but April, in particular, is a nice balance of sunny, warm days without being oppressively hot. The average temperatures depend on a few factors, but it's safe to assume the closer you are to the Caribbean, the warmer the days and nights will be. While April showers may make May flowers, the summer months bring much more rain. April is relatively dry in Florida. Miami, for example, sees just 3.2 inches of rain in April, spread across seven days of the month. Rain will increase in May and further into summer. Days are long in April, with 13 daylight hours by April 20. It's also one of the sunniest months in the state—second only to July. The water temperature for the Gulf of Mexico (West Coast) and the Atlantic Ocean (East Coast) averages around 77 degrees Fahrenheit (25 degrees Celsius), making it a perfect time of year to take a dip in either body of water. Of course, if this is too cold for you, there are no shortage of heated pools in Florida, so you can still wade without getting a chill. Beach weather is in full swing, so the first items in your suitcase should be a swimsuit and sunscreen. You will also want to bring shorts, tank tops, and sandals, as well as nicer, resort casual clothing to dress for sit down dinners. Another must-have item comfortable walking shoes, whether closed or open toed, and a light rain jacket for a surprise storm. Florida's event calendar is jam-packed in April, as many of the state's famed theme parks hold special events. There are also events dedicated to film, music, art, and more. 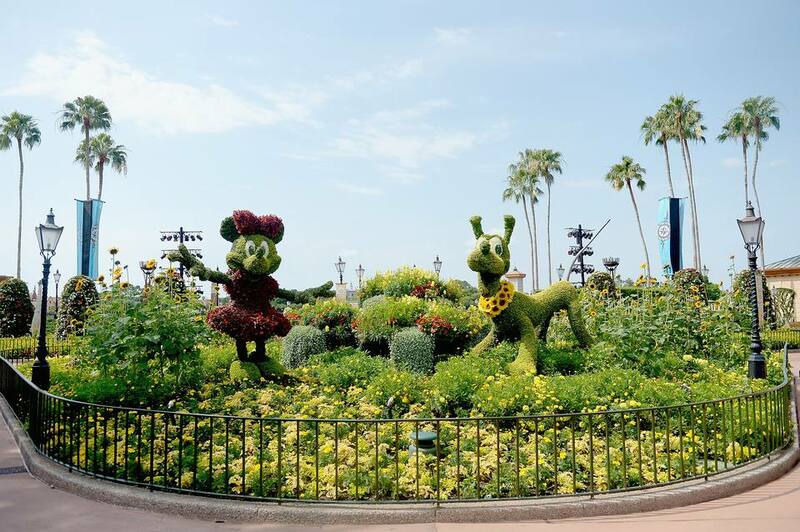 Epcot International Flower and Garden Festival: From March through May, you can enjoy the floral wonders of Epcot. The Walt Disney World Resort hosts the annual event that displays over 30 million blooms, and the celebration is a breathtaking sight. The roses, wildflowers, topiaries, and herb gardens will flourish for the entirety of the event's seven-week run. Florida Film Festival: Held across 10 days in April at the Enzian Theater in Orlando, the festival showcases the best American independent films, as well as international films. It is fast becoming the best respected regional film event in the southeastern United States. Palm Beach International Film Festival: This celebrity-studded event showcases more than 120 international films from over 20 different countries. Springing the Blues Festival: Taking over Jacksonville in early April, this free outdoor blues festival features performances from renowned blues artists from around the globe. Universal Orlando's Mardi Gras: This annual event transforms this central Florida theme park into the Big Easy with Mardi Gras parades, musical performances, and more every Saturday night from February through April, with additional dates on Sundays and some weeknights. Viva la Musica: SeaWorld Orlando heats up Saturdays during this annual festival that features food, fun, sights, and sounds of Latin culture. SunFest: Some of Florida's best music festivals take place during the spring and this one is no exception. This waterfront festival takes place in West Palm Beach and features five days of top musical acts. Theme parks can be somewhat crowded in April due to spring break crowds. If you're planning on park-hopping, it's best to do so at the end of the month. If you like to fish, April is a great month for many popular species. Cobia, red grouper, tarpon, and lane snapper are all biting during this month. Spring is the best time to kayak through Florida's lush landscapes. Rainbow Springs State Park in Dunnellon is the best place to float through the moss-filled flora.